Renault Trucks and Renault Sport Racing came together to conceive the limited edition T High Renault Sport Racing, dedicated to driving pleasure. This very special series is limited to 99 models. 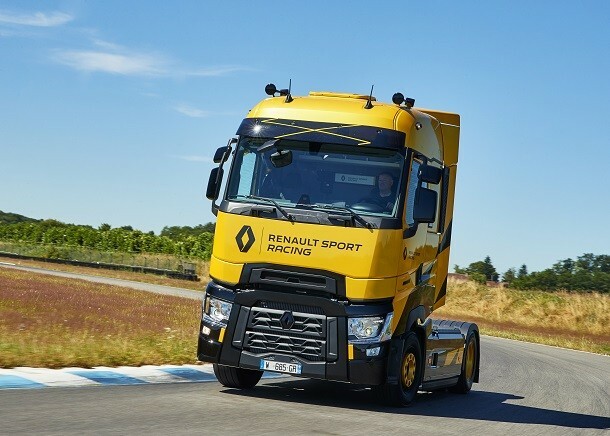 Equipped with a 13-liter engine developing a 520hp power (382 kW) and combined with a completely automated Optidriver gearbox, the T High Renault Sport Racing is along the most powerful trucks on the market. It is easily recognizable by its sporty look and its yellow Sirius bodywork with black touches (on the rear view mirrors, the rhombus or the radiator grill), which is a reminder of the famous colors from the Renault Sport models. In order to put emphasis on this effect, the famous yellow and black checkerboard is visible on the sides. As for every vehicle manufactured by Renault Trucks, this limited edition, with its numbered identification tag, is manufactured inthe Bourg-en-Bresse factory in France. It also has the Origin France Warranty label. The designers of the T High Renault Sport Racing wanted to develop an efficient and powerful truck. Indeed, the engineers have thought about comfort and interior design.Thus, in addition to a completely flat floor, the cab includes quality elements in harmony with the outside colors. There is a black leather wheel with yellow stitches. These stitches are also on the berth and carpet. For the "sporty" effect of the truck, the desginers added a carbon finish on the dashboard and sleeve (yellow of course) of the safety belt.